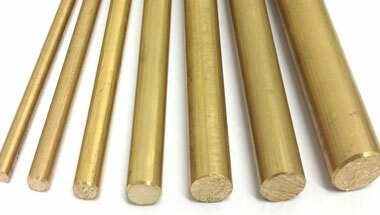 Brass Round Bars & Rods Manufacturer, Bronze Round Rods Supplier & Exporter in India. Manufacturer & Exporter of Brass Round Bars & Rods, Bronze Hex Bars, Brass Square Bars & Bronze Round Rods Supplier in India. Neon Alloys is a leading manufacturer & exporters of Brass & Bronze Round Bars. These are made by using the finest grades of Brass & Bronze by using cutting edge technologies. Brass & Bronze Round Bars are available in options of a wide range of alloys and in different material finishes. Being of superior finish quality, we are export this brass round bars in varied finish options in terms of sizes, lengths, thickness and diameters so as to meet the different demands of the customers. These Brass Round Bar are manufactured under close supervision of experts and these are appreciated for rust resistance, heat tolerance and effective performance. Our Brass & Bronze Round bars & rods are widely used in various application industries such as Cement industry, Power Industry, Sugar Mills, Chemical Plants, and Pharmaceuticals etc. As a result to that our export account today is in over 45 countries some of them are United States, United Arab Emirates, Canada, Pakistan, Spain, France, United Kingdom, Indonesia, Iran, Kuwait, Mexico, Malaysia, Nigeria, Singapore, Saudi Arabia, Netherlands, Brazil, Colombia, Egypt, Iraq, Sri Lanka, Russia, Vietnam, South Africa,, Nigeria, Turkey, Bangladesh, Italy, Japan, Thailand, Hong Kong, Switzerland, New Zealand We welcome your inquiries. Brass Rods, Bronze Round Bars, Alloy Brass Round Rods, Alloy Bronze Hexagonal Bars, Brass Bright Bars Supplier & Bronze Bars Exporter in India. Cameroon, Azerbaijan, Colombia, London, United States, Kazakhstan, Russia, Bahrain, Israel, UK, Thailand (Bangkok), Indonesia, Houston, South Africa, Iran, Peru, Sri Lanka, Turkey, Sudan, Trinidad and Tobago, Mozambique, Malaysia, New Zealand, Nigeria, Iraq, Germany, Morocco, Dubai, Vietnam, Egypt, Angola, Italy, UAE, Venezuela, Ethiopa, Australia, Democratic Republic of the Congo, Canada, Mexico, Kuwait, Jordan, Brazil, Algeria, Chine, Ghana, Tunisia, Africa, Argentina, Saudi Arabia, Uganda. Subra al-Haymah, Mbuji-Mayi, Beirut, Maputo, Luanda, Benin, Yaoundé, Sharm el-Sheikh, Conakry, Pretoria, Johannesburg, Bulawayo, New York, Kano, Soweto, Kaduna, Lubumbashi, Kinshasa, Riyadh, Port Elizabeth, Jeddah, Antananarivo, Aqaba, Accra, Algiers, Singapore, Douala, Bamako, Nairobi, Abidjan, Addis Ababa, Rabat, Byblos, Khartoum, Omdurman, Durban, Cairo, Bethlehem, Kampala, Giza, Mogadishu, Maiduguri, Alexandria, Hong Kong, Ibadan, Dammam, Jerusalem, Cairo, Zaria, Casablanca, Mecca, Tripoli, Tel Aviv, Dubai, Data from the UN, Amman, Dakar, Doha, Lusaka, Muscat, Kolwezi, Port Harcourt, Cape Town, Tehran, Ouagadougou, Freetown, Fez, Colombo, Harare, Manama, Dar es Salaam, Lagos, Istanbul, Brazzaville, Abu Dhabi.